Ramen Suguru is a ramen joint just a 2-minute walk away from Eiden’s Shugakuin Station. The owner-chef of the famous Ramen Touhichi, where there is always a line in front of the restaurant, Mr. Sodeoka, started his second restaurant here with the motto of “pork and wheat are what’s most important.” They take their ingredients very seriously here; so seriously, in fact, that others surely can’t do the same: they use Kohara pork only from the Kyotanba area of Kyoto Prefecture and their handmade noodles are made using only wheat from Hokkaido. At Ramen Suguru they offer three types of noodles, shoyu ramen, shio ramen, and miso ramen (depending on the season, they sometimes have other types of ramen available for a limited time). The ramen here is, as expected of a restaurant by the same people behind Ramen Touhichi, exceptional, and you won’t find another bowl of ramen like it in Kyoto, and there is also the excitement that the taste of the ramen here is still going to continue evolving. The restaurant is in the Ichijoji area of Kyoto, which is the most contested ramen battleground area in Kyoto, but as the restaurant is close to Shugakuin Station, there are not too many people in the area. The tables and chairs of the restaurant are wooden and it has a casually Japanese atmosphere. The young and the old, men and women alike, all visit this restaurant. This bowl of shoyu ramen could be said to represent Ramen Suguru as a restaurant. The soup is so clear that it’s hard to believe that the soup stock is made with pork bones. There is none of the unpleasantness sometimes present in pork stock, but from the first spoonful, you get hit by the combined umami of both pork and soy sauce, as the fragrant but delicate taste of the soup takes over your mouth. The supple, thin, and straight noodles have a definite taste of wheat to them, and they’re made by hand at the restaurant. This is the perfect combination of pork and wheat. The ingredients are white leek, green leak, nori, and two types of chashu pork (pork belly and shoulder roast). This is the recommended ramen for first comers, as there is something nostalgic in the taste, but the ramen still manages to feel completely new. This ramen has the same base as shoyu ramen, but it has a shio tare sauce added to it that contains gifts from the sea, like many types of salt, konbu seaweed, and seafood. This is a premium shio ramen. The taste is relatively light, but as you take a sip of the soup, you can taste the concentrated umami in all of the ingredients and enjoy the depth in its umami. The noodles are the same as shoyu ramen, slightly soft, thin, straight noodles made by hand at the restaurant. The ingredients are white leek, green leak, nori, hosaki-menma (ear of menma bamboo), and two types of chashu pork (pork belly and shoulder roast). This ramen is recommended to those who like ramen with a light taste. This ramen is completely different from the ramen above, as this is a miso ramen with a strong taste. The soup is made with a thick pork paitan stock and a tare sauce containing five types of miso and all kinds of marine products. The curly noodles are thick so that they don’t lose to the rich taste of the soup, minced pork seasoned with Japanese pepper from the Wakayama Prefecture, chashu, and shiso leaf. The shiso leaf brings a nice accent to the strong taste and works as a gentle stimulation on your taste buds. I’m sure you will be surprised by how well pork and miso go together after enjoying a bowl of miso ramen at Ramen Suguru. The manager of Ramen Suguru used to work at one of the most famous ramen restaurants in Kyoto, Shakariki, and the owner of Shakariki told him that “If you’re going to do pork broth, you need to also offer a miso ramen.” That is why you can enjoy miso ramen at Ramen Suguru. This is one item of their side menu, toriten fried chicken. Like you can see, the chicken pieces are big and look very nice. They’re always served freshly fried, so the outside is crisp, and inside the meat is soft. And unlike karaage, this is tempura, so the batter is thin, and it’s surprisingly easy to eat a lot of toriten. So, those who like meat, and those who want a bit more with their ramen, consider ordering toriten! First, buy a ramen ticket at the ticket machine. Put money into the machine and press the button of your ramen. Although they have no English menu, the ticket machine has pictures, so you can choose based on those. 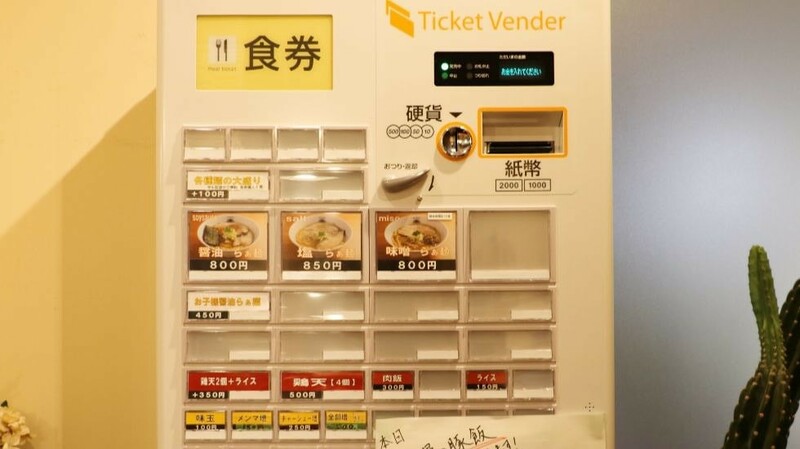 So choose your ramen based on this article, and then press the picture of it on the ticket machine. Note that you buy the ticket after entering the restaurant, so if there’s a line, wait until you can enter the restaurant before buying your ticket. Ramen Suguru also offers seasonal ramen for limited periods of time and daily changing rice bowls. *On the day I went to the restaurant, they had a pork belly with cartilage rice bowl. If they have a special ramen or rice bowl for that day, the staff will tell you about it. Ramen Suguru, a ramen restaurant with the concept of wheat and pork, is the second ramen restaurant by the man behind the always popular Ramen Touhichi. I have eaten an uncountable number of bowls of ramen up until now, but I feel that Ramen Suguru’s ramen is the most delicious, beautiful, and adventurous example of Akira-style* ramen there it. When you talk of the perfectness of a bowl of ramen, Ramen Touhichi would take the first prize, but when you talk of how exciting and new a type of ramen is, then I think Ramen Suguru is the best example you can find. This restaurant was just founded in April, 2018, and it’s nice that since it’s a bit far from Kyoto Station, you can eat ramen without having to line up. This place is sure to become popular, so I recommend going early. *Akira-style is a tonkotsu, pork bone style of ramen. It’s named after Daiichi Asahi, a ramen restaurant close to Kyoto Station offering pork bone ramen with clear soup. It’s named Daiichi Asahi because the character for Asahi can also be read Akira. This ramen restaurant specializes in ramen made from pork, but unlike many other ramen restaurants specializing in tonkotsu or pork bone broth ramen, theirs is not thick and whitish, but thin and clear. It’s really difficult to make this kind of ramen from pork, and Ramen Suguru does a wonderful job at it. There is none of the unpleasantness so often present in pork based broth, but the broth has a mild and pleasant taste to it. A special mention needs to go to the soy sauce used in their ramen, which adds a lot of character to the pork broth. As you can probably guess, my favorite here was the shoyu ramen. A 2-minute walk from Eiden’s Shugakuin Station. Thursdays and the first and third Wednesday of the month. Their menu is only in Japanese, but they can understand some simple English.